It’s easy keeping an eye on the monkeys because I cycle past Don Chao Poo and Don Jik every day. 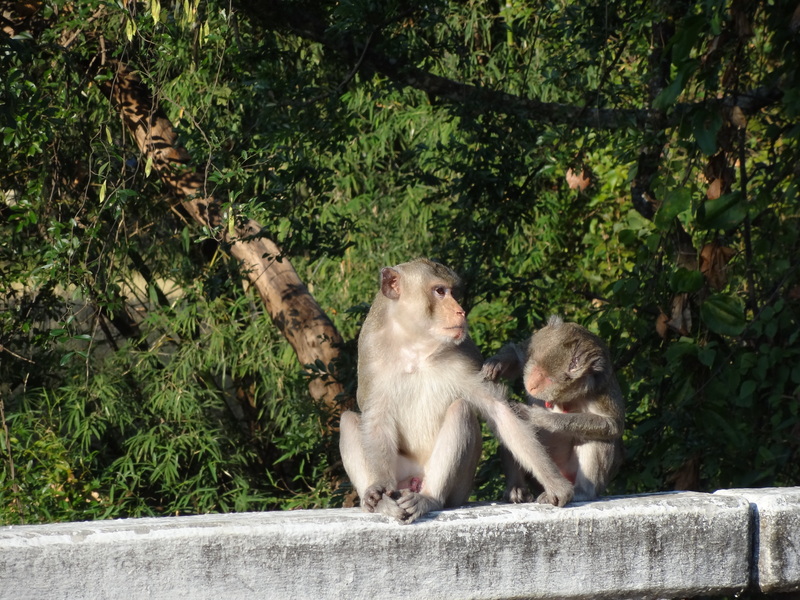 I sometimes get to Don Jik before the monkeys have come down from the trees, but more often when I get to the bridge there are at least a few of them there. One day I counted 20 of them but usually I only see about half that number. In Don Chao Poo there are 400, 500, 600 perhaps, and the sheer size of that colony may be why my visits to Don Jik often reveal more intimate moments. One recent morning I got to Don Jik just in time to see a large male crossing the road at the bridge. He was crossing from the north to the south, and went down to the flat, sandy clearing where a farmer (who was absent) has a hut, a bag of stones and a catapault. Within minutes of his arrival on the south side, an almighty uproar broke out. Momentarily I thought he had been attacked by a dog, and I continued to think so as more and more monkeys came down from the trees, all making loud, angry growling sort of noises. 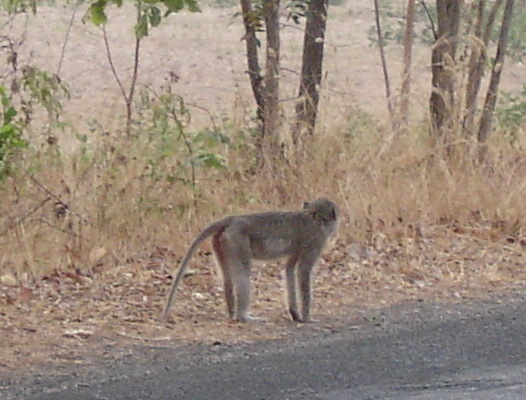 I couldn’t see any action but could hear it well enough, and a few moments later that same large male came back up onto the road, chased by other monkeys. They saw him off across the road and into the riverside trees. They didn’t follow him, but gathered in a group on the bridge. 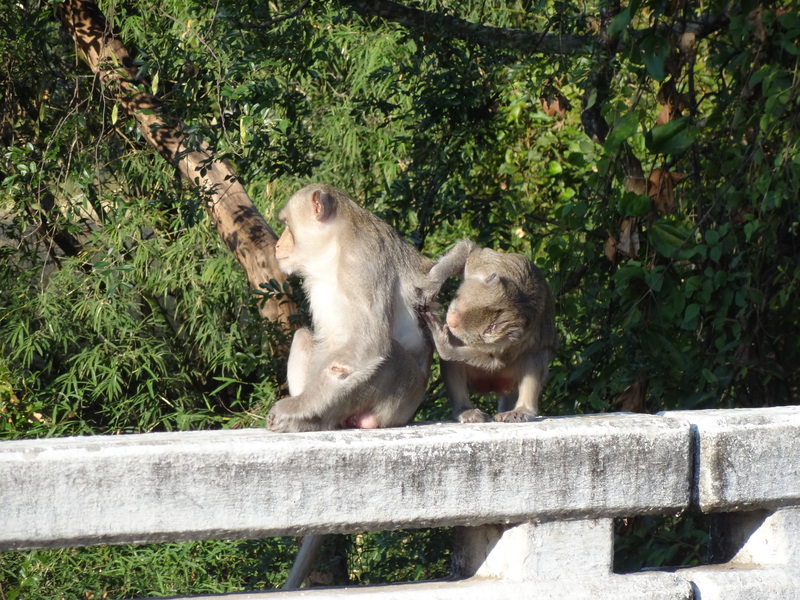 They were joined by all the other monkeys, all of them coming from the trees on the south side. They gathered on the roadside and it was easy to count them: males, females, young adults, juveniles, infants: 20 of them in total. This was the first time I had seen all of them together at the same time, although I had counted 20 before, as they slowly emerged from the forest. It was pretty clear that they were all aware of the nature of this event: a crisis for the group, and they had responded as a group and were staying together in group solidarity. I didn’t use my camera that day out of respect for their nervous and excitable condition, but a couple of days later I did catch the alpha male with one of his older female mates in a touching little scene that said a lot about what had gone on. Click to enlarge the picture. You will notice that the female is attending to a gash on the male’s back, while she herself seems to have suffered a loss of hair on top of her head. “I’ll take a look at that for you, dear,” she murmurs (sorry about the anthropomorphism! ), and she does. He is being very stoical about it all, isn’t he? If you enlarge this photo you will see more clearly the injury similar to his on the top of her head, which suggests that she played a full part in the scrap when the colony was invaded. She may even have been the focus of it. Anyway, the old male seems very appreciative of the attention he has received and repays her with a bit of gentle grooming. 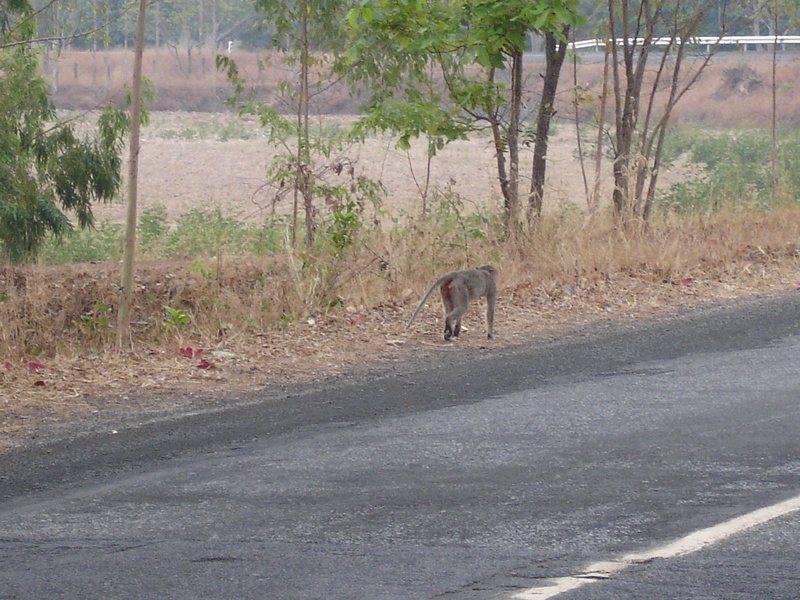 The first monkey I ever saw at Don Jik was an older male, about a year ago, and I caught him on camera leaving the bridge along the road towards Don Chao Poo. He was not particularly happy, I thought. The picture below is of very poor quality but agin if you enlarge it, you will see that he is carrying an injury similar to the ones we have seen on the male and female above. I assumed at the time that he was an intruder from Don Chao Poo. Certainly, at Don Chao Poo there are older male individuals who seem to spend their time outside any group. Presumably, they are former alpha males who have been supplanted by younger, stronger, more virile rivals. Now I am not so sure. It is also possible that he was being expelled from the colony at Don Jik. Of course, it may well not be the same individual, and he may have been expelled or outcast from either colony (or even both), and attempting to make his way into a new one or to return to his original one. What happens to these outcast males would seem to be an interesting subject for further research. 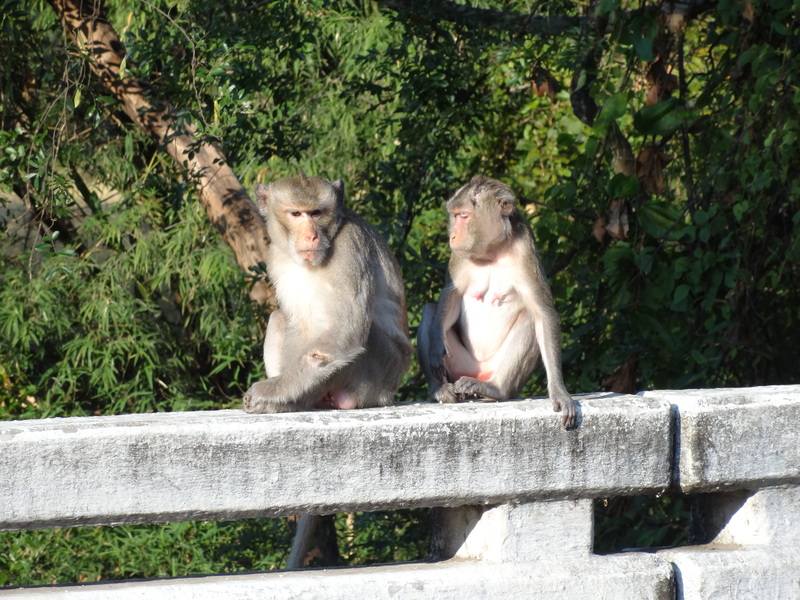 This entry was posted in Amnat Charoen Province, Long-tailed Macaques, Macaques, monkey forest, Monkeys, Research and tagged Amnat Charoen Province, Amphur Phana, Don Chao Poo, Long-tailed Macaques, Macaques, monkey forest, Thai monkeys. Bookmark the permalink. Good story, I think this could make s good story line in a TV Soap, although these characters are further evolved than the ones we are used to seeing in Easterenders.